Nicole Baginsky, ACS ’06, was recently honored as a Greater Middlesex Conference Scholar – Athlete at the Pines Manor in Edison, NJ. Nicole has just graduated from Cardinal McCarrick High School in South Amboy, ranked 11th in her class. She is a member of the National Honor Society, the Lyceum and various other clubs and organizations at the school. Nicole led the Lady Eagles Bowling Team to its first undefeated season this past year, winning the GMC Blue Division Title and the Central New Jersey Section I Championship. The Lady Eagles finished 2nd in the State Sectional Championship this year. Nicole rewrote the Cardinal McCarrick record book; she currently holds all of the Lady Eagles bowling records (something she also did in the ACS Bowling Leagues). 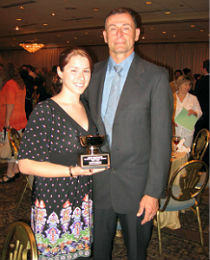 Her 2008 – 2009 GMC Individual Tournament Championship was the first Individual Championship won by a Cardinal McCarrick athlete. Nicole is planning to further her academic and athletic careers at New Jersey City University where she plans to major in Psychology and bowl for the nationally ranked Gothic Knights.